GerbView - View and convert Gerber, Excellon and PDF. Convert to DXF, PDF, TIFF and Gerber. GerbView™ can view, print and convert Gerber, Extended Gerber, ODB++, PDF, Excellon, PLT, HPGL/2 and other file formats. Gerbview will visualize your design, on the screen or in hardcopy. 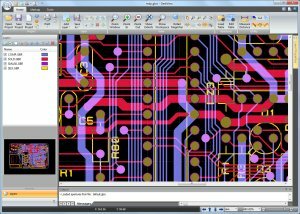 No more waiting for photo plots or a prototype circuit board, to see your true design. GerbView supports both RS-274D and RS-274X Gerber formats, and you can use it to convert your older Gerber files to the new RS-274X extended format. 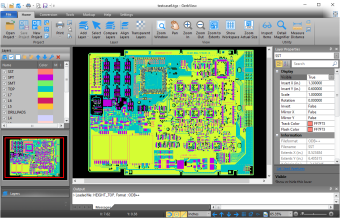 The newer extended Gerber format contains embedded aperture information, and this minimizes the risk for errors during the manufacturing of the PCB. With GerbView's PDF to CAD capability you can convert your Adobe PDF files back to editable Gerber RS-274X and DXF files. GerbView can create layered PDF, DXF and DWF files where each loaded Gerber file will correspond to a separate layer in the destination file. Check out our blog to read more about how you can create layered PDF files with GerbView. You may in addition create a multi-page PDF file from all loaded layers, where each layer will be placed on its own page in the output file. With GerbView you can export individual layers, or the whole workspace, to any of the supported raster formats, which includes TIFF, JPEG, PNG and BMP. The resolution and number of colors used for the conversion can be set by the user. In GerbView you work with a workspace that can contain one or more files (layers) of any of the supported file formats. The workspace can be saved for later use. The workspace will reference your design files, so only need to reload the workspace to see the whole design. You can set the size of this workspace to one of the preselected paper sizes, or to a custom size. Use the precise measure tool to verify distances and areas. Check apertures used by tracks and flashes using the query and aperture highlight tools. Markup elements like text, barcodes, QR-codes, images, arrows, lines, symbols, ellipses and polygons can be added to the workspace, and will be included during conversion and printing. All types of markup elements, for example text or barcode, may be "burned-in" to become a permanent part of a Gerber layer. You may print your files using a custom scale, for example 100% for original scale, or using fit to page. The print poster mode, also called tiled pages, can be used to print large designs and drawings on multiple sheets. Header, footer and watermark information can optionally be added to the printed sheets. Download an evaluation copy from the download page. View, print, markup and convert Gerber, Adobe PDF, ODB++, Excellon, Autodesk DXF and HPGL/2. 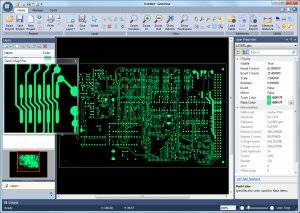 Convert to Autodesk DXF, PDF, DWF, Gerber and other formats. Convert multiple Gerber files to a multi-layer PDF, DWF or DXF file. Convert ODB++ to a layered PDF, or to individual files using Gerber, PDF, DXF or SVG formats. Convert PDF to Gerber, DXF, SVG or HPGL/2. Gerber X2 attributes are supported. Query for aperture and tool information in Gerber and Excellon files. Measure distances, areas and perimeters, with our without snapping to pads and tracks. Highlight selected apertures in Gerber files. Add files of different formats as layers. An unlimited number of layers can be added to a workspace (only limited by memory). Visibility of all loaded files can be set individually. View Gerber layers with or without transparency. Invert negative Gerber layers (e.g. power-plane) to positive for correct display and conversion. Rotate, mirror and scale layers. Delete a selection of items from a Gerber file. Supports up to 1000 different apertures. Copy a selected region to clipboard, and paste into another application. User defined header and footer for printing. Poster mode for printing big format drawings on multiple sheets. TIFF, CALS, Adobe PDF, Windows BMP, PNG and JPEG. Add markup using lines, text, rectangles, images, qr-codes, barcodes, symbols, polygons and more. Markup elements are stored in a separate file. Markup burn-in feature for converting markup elements to native Gerber data. Mouse-controlled zoom in, zoom out, zoom area and panning. Command line conversion and printing. 1.PDF files that only contains raster, e.g. : scanned drawings, are not supported by GerbView. 2.For multipage PDF files each page may be imported as a separate layer. 3.Each file will be loaded as a layer - you can view, print and convert layers individually or combined. 1. You may load multiple Gerber files and convert to a single multi-layer file using this format. Compatible with Windows 7, 8.x and 10. 1 Added support for EBCDIC encoded Gerber files. 2 Added an option for setting default quadrant mode for Gerber files. This is normally not required as it is usually defined inside the Gerber file. 3 Increased resolution for exported SVG files. Added circle element to exported SVG files. 1139 EBCDIC encoded Gerber files could not be loaded. 1134 Some of the pads in an ODB++ file had wrong rotation. 1131 Some Excellon files with FMAT,2 command set were sometimes loaded with wrong drill sizes. 1127 ODB++ file from customer failed to open. 1109 Missing anti-pads in ODB++ file. 1108 A duplicated G37 command was in some rare cases added to exported Gerber files. 1107 Some of the pads in an ODB++ file had wrong rotation. 1106 Missing details in Gerber file. 1104 Loading a Tango aperture file could cause program failure. 1103 Missing anti-pads in ODB++ file. 1 Added an option for setting a default scale for added PLT (HPGL/2) files. 1099 Converting a HPGL/2 file to PDF caused some of the lines to be displaced and appear as noise. 1070 Excellon file was not loaded with correct unit (Metric instead of Inches). 1064 Some of the flashes were loaded with wrong polarity. 1060 Some of the paths in an imported PDF had wrong line end cap styles. 1032 ODB chamfered rectangles were not displayed correctly. 1 Added an option for displaying mirrored markup text. This feature may be very useful if you for example want to burn in mirrored text on a bottom layer. 1025 Some ODB pads that should be rounded rectangle were incorrectly displayed as ordinary rectangles. 1024 The tool sizes in an Excellon file from customer were wrong. 1017 An ODB++ file from customer could not be loaded. - The correct layer names will now be written to exported DXF files. 1 Add option to mirror Excellon files. 2 Added monochrome (Black & White) option for multi-file export. 3 Added option to add margins for multi-file export (PDF, DWF). 4 Added option to add margins for multi-layer export. 5 Added option to add margins for multi-page export. 992 Excellon G85 (slot) command was not supported. 991 Excellon file from customer failed to load. 987 PDF to DXF: Some of the text were not correctly converted. 1 Added RS-274D (legacy Gerber) as an output option for conversion dialogs. 2 Mirror and flip do now work for HPGL/2 plotter files. 981 Some macro apertures in file from customer were not displayed correctly. 969 Some thermal pads were incorrectly overlapping other pads. 968 Drill sizes were lost for Excellon drill file from customer. 949 Exporting a Gerber file from custom with to RS-274X turned some small arcs into full circle. 944 Some of the apertures in gerber files generated by Tango, were not displayed correctly. ### In some cases the colors could be reset to default when loading a project file. 1 The project format is now a Unicode text file that can be edited by Notepad, or other text editors, if needed. 2 Layer on/off state are now stored in the project file. 3 Added transparency option for the Save As Bitmap function. 932 Converting PDF to DXF: some filled circles were not completed. 931 Some of the text in HPGL/2 file had wrong rotation. 928 Gerber files not loaded. 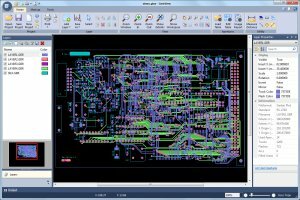 926 Missing pads in files generated by Altium Designer. 911 ODB+ file from customer failed to open. 892 Some macro apertures was not drawn. ### The actual numbers of layers are now written to the DXF file (no longer always 256 layers). 888 Some arcs was incorrectly drawn as full circle in an ODB++ file from customer. 885 Some arcs was incorrectly drawn as full circle in a Gerber file from customer. 884 Drill size information was not read from an Excellon file. 880 Now supports P-CAD aperture file format. 878 An ODB++ TGZ file from customer failed to open. 861 PDF to Gerber: Some sub-paths were not converted correctly in file from customer. 860 Some macro apertures in file from customer were drawn using wrong polarity. A complete list of all updates can be found on the GerbView updates page. Screenshot showing the demo project that is included in the installation. The sample project file is named demo.gbw. Click on the thumbnail to display larger image. Screenshot showing GerbView with an active magnifier window. The magnifier window will show a zoomed in display of the current mouse position. Screenshot showing a project in transparency mode. Transparency will make sure all layers are visible. The transparency value may be set between 0 (no) and 100 (full) percent transparency. All online transactions are handled by Share-It.com. Share-It is one of Digital River's MyCommerce solutions. All MyCommerce solutions are secured by Digital River's enterprise e-commerce infrastructure, which includes a proven payment gateway, advanced fraud prevention, 24x7 customer service and much more. This software maintenance agreement can optionally be renewed after the first free year. Software maintenance is optional and you're free to choose not to continue the maintenance program. If you do not renew the software maintenance your license(s) will continue to work as normal, but you will not be able to install and use the latest updates.